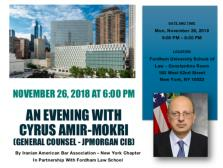 On November 26, 2018, IABA-NY, in partnership with Fordham University School of Law, organized an event with esteemed speaker Cyrus Amir-Mokri. Mr. Amir-Mokri is the General Counsel of the Corporate & Investment Bank at JPMorgan Chase. After immigrating to the U.S. from Iran, he earned a bachelor’s degree in Biochemistry from Harvard followed by a Ph.D in History and a J.D., both from the University of Chicago. He previously practiced at the law firm of Skadden Arps Slate Meagher & Flom LLP, where he was a partner in the antitrust and litigation groups. He also served in government, both as Assistant Secretary for Financial Institutions at the U.S. Treasury under President Obama and as Senior Counsel to the Chairman of the Commodity Futures Trading Commission. In 2012, he received the honor of being listed in the Carnegie Corporation’s “Great Immigrants: The Pride of America” and, in 2010, he was a recipient of the Ellis Island Medal of Honor. Mr. Amir-Mokri’s remarks at the event focused on the experience of being an immigrant in America and his advocacy in support of involving the Iranian American and other immigrant communities in public life. On August 4, 2018, IABA-NY hosted a Persian potluck picnic networking event. Members were invited to attend and meet other Iranian American lawyers in an informal atmosphere at Sheep’s Meadow in Central Park. On February 7, 2018, IABA-NY presented a CLE panel discussion at Hughes Hubbard & Reed LLP on the third version of President’s Trump ban, which blocks entry into the U.S. of most citizens of Iran, Chad, Libya, Somalia, Syria, and Yemen. The CLE program featured panelists Parisa Karaahmet, a partner at Fragomen, Del Rey, Bernsen & Loewy; Marjan Kasra of the Law Offices of Marjan Kasra, LLC; Kate Meyer, a staff attorney for the International Refugee Assistance Project; and Noor Zafar, a Bertha Justice Institute fellow at the Center for Constitutional Rights. The discussion focused on the scope of the travel ban, the rights of affected communities, the impact on Iranian and other minority communities, and the status of litigation against the ban. IABA's New York chapter proudly marched at the Persian Parade in New York City. The Persian Parade was fun, enthusiastic and well-attended event as always and IABA NY was pleased to once again participate in this terrific event. In celebration of Nowruz, the New York chapter of the Iranian American Bar Association, in conjunction with Public Affairs Alliance of Iranian American, hosted its sixth annual Nowruz Dinner Gala at the elegant and historic New York County Lawyers Association building in downtown Manhattan. We were honored to host respected and accomplished friends and colleagues from the Iranian community. The event included a three-course Persian dinner, live entertainment by Persian instrumental artists and traditional Nowruz decorations. The two keynote speakers were: the Honorable Darius Shahinfar, City Treasurer for the City of Albany, and the second Iranian American to win elected office in New York State; and Ali Mojdehi, a partner at Cooley LLP, who successfully represented Judge Ashley Tabaddor, an Iranian-American, in her suit against the Department of Justice for an order requiring her to indefinitely cease hearing cases involving Iranian nationals. IABA NY was honored to co-host this wonderful event and special and successful evening. IABA New York held a networking and game night on February 3, 2016 in New York City at Gallow Green at the McKittrick Hotel. Lawyers and non-lawyers alike attended this fun event, which featured many familiar faces as well as new attendees of IABA NY events. IABA New York's Pro Bono Committee hosted a Law Day Event at Benjamin N. Cardozo School of Law on Sunday, November 15, 2015. This free event was focused on helping individuals with issues such as: immigration, Medicaid, Social Security and elder law. Services were offered in both English and Farsi. IABA New York held a free CLE program on Tuesday, October 27, 2015 at Baker & McKenzie LLP in New York City. The CLE program, titled "Iranian Sanctions Update: Impact of the Iran Deal", explored how the Iran Deal changes the sanctions regime and impacts U.S. and foreign individuals and businesses dealing with Iran. The evening's speakers included Erich Ferrari of Ferrari & Associates, P.C., Melvin Schwechter of BakerHostetler, and Hannah Zarkar of Baker & McKenzie LLP. The event was open to lawyers and non-lawyers alike. IABA New York held a networking event on Long Island at Rimon restaurant in Great Neck on Thursday, October 15, 2015. The event featured networking and a great chance to connect with IABA NY's many Long Island members, including first time attendees of IABA NY events. On June 25, 2014, the IABA-NY organized a CLE on “Ethics and Social Media,” offering 2 CLE credits to all attendees. An esteemed panel consisting of Hon. Ronald J. Hedges, Former Magistrate Judge of the U.S. District of New York. Mark A. Berman of Ganfer & Shore, and Jerry Ferguson of BakerHostetler led a spirited discussion of the unique ethical challenges presented by the changing landscape of social media and networking. Pedram Tabibi of Meltzer Lippe moderated the panel. The event was a huge success, with more than fifty people in attendance. Special thanks to BakerHostetler for hosting the event and to the New York State Bar Association Young Lawyers Division for co-sponsoring the event. IABA marched proudly at the Persian Parade, which drew record crowds this year, perhaps due to the enchanting Spring weather. Happy chants of "Barikalah Vakilha" (Bravo, Lawyers!) came from the crowds. As always, the Parade was a very fun event and introduced the IABA to several new members. The New York Chapter of the IABA held its fourth annual Nowruz Gala at the lovely grand ballroom of the New York County Lawyers’ Association building. This years event, celebrating the Persian New Year, was our most well attended Nowruz Dinner to date, by many accomplished professionals in the legal and Persian community. The Honorable Thomas P. DiNapoli, NYS Comptroller was our Keynote Speaker, and Professor Ehsan Yarshater, Director of the Center for Iranian Studies at Columbia Universty, was our Honoree for his exemplary work as Founder and Editor of Encyclopedia Iranica. The night started with a cocktail hour with open bar, accompanied by the beautiful live Persian music performed by Tomchess and Navid Kandelous. Dinner was served with an array of Persian food including kebabs, stews, vegetarian and various rice dishes from Colbeh Restaurant and Shiraz Restaurant of Westchester. Following the meal, the IABA-NY Board welcomed the attendees and updated the guests about the IABA followed by our featured speakers, Honorable DiNapoli and our Honoree, Professor Yarsharatar, who shared their lives and gave words of inspiration about their remarkable experiences. January 23, 2014 - Dinner, Networking and "A Separation." The IABA and Cafe Nadery came together to screen of "A Separation," the Oscar award winning film by Asghar Farhadi. The IABA-NY held a CLE event entitled "An Iranian Sanctions Update: Interpretation and Implication of OFAC Policy." This Continuing Education (CLE) event explained the new provisions of Iranian Sanctions and their impact on individuals and businesses. Erich Ferrari of Ferrari Legal, P.C., and Melvin S. Schwechter of Baker Hostetler were our esteemed speakers. The event was held at Baker Hostetler in Rockefeller Plaza. IABA attended a private tour of Iran Modern, a new exhibition at the Asia Society Museum. Among the highlights included beautiful calligraphic paintings and sculptures from the Saqqakhaneh movement. IABA held a Summer kickoff event at the Sky Room, 330 W 40th Street, the highest roof deck bar in NYC. Co-Sponsored by New York County Lawyers' Association; Brooklyn Bar Association; the Asian American Bar Association of New York; the Puerto Rican Bar Association of New York. Guests enjoyed networking opportunities and an unparalleled view of NY. The IABA-NY partnered with the New York County Lawyers’ Association on June 5, 2013 to present the program "Understanding and Complying with the Regulatory and Tax Implications of the Affordable Care Act.” The program was a success! Over fifty professionals attended to learn about Obamacare and earn 1.5 CLE credits. The panel consisted of Scott Carroll of Lippes Mathias Wexler Friedman LLP, who gave an overview of the act and dove into the practical implications of the insurance exchanges; Jonathan Boyles of McDermott Will & Emery LLP, who spoke about the practical employment implications of the act on businesses and individuals; and Alex Miller of Millennium Medical Solutions, Inc., who covered the practical tax implications of the act on businesses and individuals. The panel was moderated by Layla Tabatabaie of the Law Offices of Fern Finkel, a member of the CLE Committee of the IABA and NYCLA. With such a great turnout and an event that kept everyone in their seats throughout the full Q&A, we look forward to putting together more informative CLEs and partnering with historic organizations like NYLCA. Special thanks to Bari Chase of NYCLA for all her hard work and dedication to making this CLE a real hit. IABA participated in a Spring Networking Event organized by the Brandeis Association, which took place at the Queens Museum of Art. The surrounding beautiful environs and the large crowd made the event highly successful. An International Networking extravaganza took place at the Trump World Tower, World Bar. Members of the French American Bar Association, Iranian American Bar Association, Nigerian Lawyers Association, Swiss New York Lawyers Association and Foreign Lawyers in New York Association joined. The event was one of our most successful yet and a wonderful networking opportunity. The IABA-NY organized an informative CLE “Addressing Discrimination and Profiling: Know Your Rights (and Your Client’s)” on November 15, 2012 offering 2 CLE credits. The program was well received and a huge success with well over fifty people attending. The panel consisted of Ana Salper of Baker & Hostetler LLP, Mitra Ebadolahi of the National Security Project of the American Civil Liberties Union and Erich Ferrari of Ferrari and Associates. Ana Salper gave a broad overview of religious discrimination claims. She then discussed Title VII on religious discrimination in the workplace and the employer’s duty to accommodate. Mitra Ebadolahi gave an overview of the history of the NYPD surveillance and discussed the Handschu litigation and the revisions of the Handschu guidelines post September 11. She also discussed the revelations of widespread suspicionless surveillance of Muslim communities throughout New York in years after 9/11, the constitutional issues implicated by these searches, and the litigation hurdles. Erich Ferrari discussed the sanctions on Iran and the sanctions’ role in discrimination. The panel was moderated by Davina Amiri of the Law Office of Davina Amiri, who co-chairs the CLE Committee of IABA-NY. Special thanks to Baker & Hostetler for hosting and to PAAIA for co-sponsoring the event. In August, we were pleased to join other community organizations in supporting the Network of Iranian Professionals of New York (NIPONY) in its annual Central Park picnic. With plenty of food and games, everyone had a great time. Much thanks to Iman Baccadori--a dear friend of IABA-NY--and his friends at NIPONY for a great job. On Wednesday, June 20, 2012, New York held its first annual Persian Game Night at Casa La Femme in New York. The diverse attendees, who included lawyers from various practices, law students, and non-attorneys, battled it out in takhteh nar and hokm games late into the evening. A great crowd was in attendance. The night was a fantastic mix of networking and fun. On April 15, 2012, several members of the IABA Board marched down Madison Avenue for the 9th Annual New York Persian Parade. Sporting official IABA t-shirts, big smiles, and carrying a large banner, IABA was greeted to large rounds of applause and cheers from onlookers. Many Iranians were pleasantly surprised to see a strong presence from the "Irani" at the Parade. IABA was proud to be part of the Parade and to further establish our presence in the Persian community. We look forward to this great event next year and welcome members to join us on our walk next year. On Sunday April 1, 2012, the IABA, New York Chapter held our second annual Nowruz Dinner at the lovely New York County Lawyers' Association in its grand ballroom. Those who came, some 125 people, celebrated the Persian New Year amongst law professionals, law students and colleagues. The evening started with a cocktail hour of drinks and appetizers set to live Persian music performed by the Tomchess trio, as many gathered and met friends and peers, old and new. A hot buffet dinner was served with an array of Persian food including kebabs, stews, and various rice dishes from Shiraz Kosher Restaurant of Great Neck and Shiraz Restaurant of Westchester. Following the meal, after members of the IABA board welcomed the attendees and updated them about the IABA organization, our esteemed key note speaker, Cyrus Amir-Mokri, appointed by President Obama to the position of Assistant Secretary of the US Treasury of Financial Institutions in November 2011 spoke to the crowd. His speech was inspirational and very well received. He detailed the highlights of his legal career in private practice and shared his motivations for being involved with public service. After Mr. Mokri's talk, many attendees of the event stayed for tea and the delicious dessert, and still more socializing. All in all, it was a lovely evening. Thanks to everyone who participated. We look forward to another great Nowruz event next year!